COLORADO: Anti-LGBT Baker Sues State Officials After Being Told He Should Have Served Trans Customer - Joe.My.God. The owner of Masterpiece Cakeshop has sued Gov. John Hickenlooper and state civil rights officials, claiming Colorado has renewed its religious persecution by investigating him — in defiance of a recent U.S. Supreme Court decision — for refusing to create a cake commemorating gender transition. 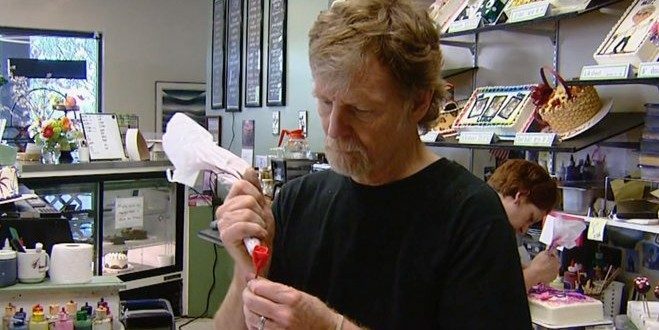 Jack Phillips of Lakewood brought the lawsuit late Tuesday night in Denver U.S. District Court against Hickenlooper and members of the Colorado Civil Rights Commission. On June 4, the same day as the Supreme Court decision, Arvada resident Autumn Scardina, filed a complaint with the CCRC claiming that Masterpiece Cakeshop denied her request for a custom birthday cake – blue on the outside and pink on the inside. The cake as “a reflection of the fact that (she) transitioned from male-to-female and that (she) had come out as a transgender on (her) birthday.